For your Panasonic Lumix DMC-G1, you have a choice of using either a cable (wired) shutter release, or if you prefer a wireless solution, an RF (radio frequency) trigger. If you’re wondering whether Pentax cable releases / remotes work on the Panasonic G1, the answer is, they don’t. This discussion thread concludes that for the Panasonic, a four-contact wiring scheme is employed, while the Pentax system has a three contact one. The socket for the remote sits above the USB / HDMI cover on the left side of the G1 (image taken from the Panasonic G1 Manual). The same cable release solutions that work for the Panasonic DMC-FZ20, DMC-FZ30, DMC-FZ50, DMC-L1 and DMC-L10 cameras also work on the DMC-G1. Alternatively, check out third-party, compatible Panasonic cable releases / remotes on Amazon. 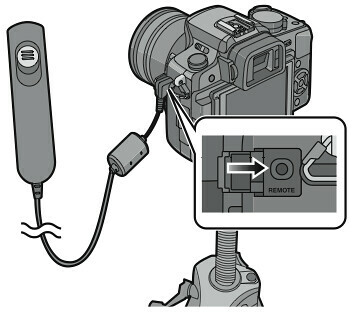 Panasonic recommends the use of the Panasonic DMW-RSL1 Remote Shutter Release in the user manual. The DMW-RSL1 remote is quite pricey for a simple cable release (DMW-RSL1 clones on Amazon are much cheaper), but it has a locking mechanism that holds down the shutter release button for shooting B (BULB) exposures. If you don’t require this functionality, the Panasonic DMW-RS1 Remote Cable Release serves the purpose and what’s better, comes in at less than one-third the price of the RSL1. You might also prefer to purchase one of the various 2.4GHz RF (radio frequency) wireless shutter release remotes on Amazon. The benefit of such a remote is that you can stand further away from the camera. The solution also does not require a physical connection between the transmitter and the receiver. Because it operates on radio frequency (as opposed to IR or infrared) transmission, line of sight between the transmitter and receiver is not required. Read my reviews on the Phottix Cleon for Nikon, Cleon for Canon and N1 for Nikon to get a better idea of how these RF devices work. Be careful about local RF usage laws in your area though. Note that the receiver unit for wireless remote solutions must be plugged into the remote jack on the G1.